I own and operate a vending business of my own so I know what people are looking for. I use quality supplies that ensure a consistent product. As you all know your machines will not make money if they are not seen. My labels are bright and shiny and a real eye catcher. We offer more candy labels than anyone. 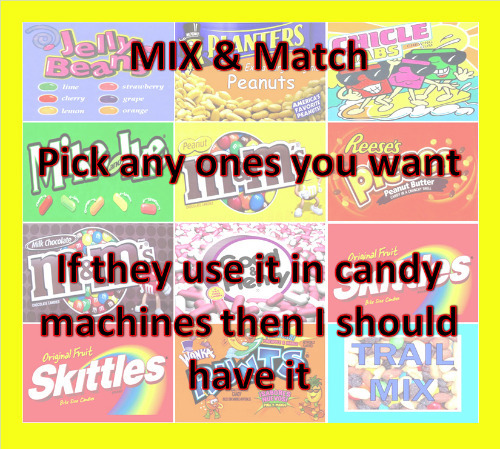 If it goes in a candy machine then i can make it! We now offer many sizes and styles of labels for any need you may have. Vinyl labels have a protective overlay that provide protection and durability. None of them leave any residue behind when you peel them off. Custom sizes are available, contact me for more info. SHIPPING IS ALWAYS FREE !! !